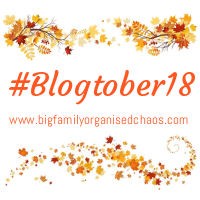 To my surprise, I had the discipline and focus to complete @bigfamilychaos #blogtober2017 and enjoyed it. So its time to join in again and write every day in October. Some posts may be short and sweet, light hearted, others more detailed and on serious topics. Its a great list this year and I’m looking forward to the challenge. So its a year since last Blogtober and what’s happened in my life? Well, I’m living in the same house in the same small seaside town, driving the same car, working in the same job, still married to Mr S, 15 years and counting, and still mum to two children, now 9 and 10. And do you know what, I really am okay with this. There’s a lot to say for the ordinary, too often we’re bombarded with the need to improve, upgrade etc.. and sometimes its time to pause and appreciate the life you have. We’ve had a lovely year doing the simple things as a family, playing, exploring, learning and being. There will always be some years that are brimming with special events, big life changes, this hasn’t been one of those years, we’ve simply embraced the ordinary.